Why are Charles and Ray Eames regarded as influential designers ? Charles and Ray Eames used new materials and technology, in the manufacture of their products. In the 1950s and 60s, they experimented with modern innovative materials such as resin, fibreglass and moulded plywood. In so doing, encouraged other designers to think broadly about their use of materials and the way they could apply new materials and technology to new designs and products. Both Ray and Charles are known for what they achieved in a range of creative and design disciplines. These included; furniture design, architecture, manufacturing technology, magazine cover page design, textiles design, ‘set’ design at MGM and film making. They even designed toys for children and clever puzzles. Charles and Ray Eames are household names in the world of design. Their designs were innovative and often ground breaking. 1. 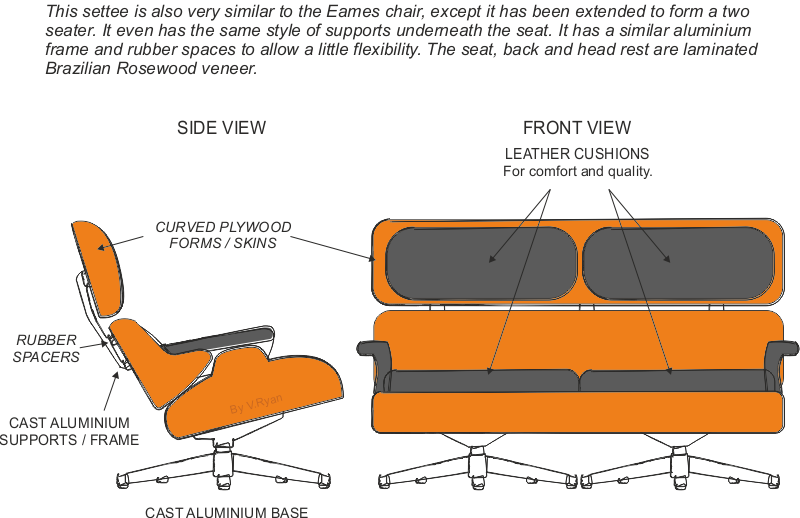 Write a specification for a two seater settee, designed in the style of the Eames Lounge Chair. Include four specification points. The settee must seat two people. It must be ergonomically designed so that it is comfortable to use. It must be manufactured using the same type of materials and processes, as the original Eames Lounge Chair. The settee must be in the same style and display similar aesthetics, as the Eames Lounge Chair. 2. Draw / sketch a range of initial ideas for the settee. Your ideas must meet the specification you have written.